Anterior cervical discectomy and fusion (ACDF) is a surgical procedure performed to remove a herniated or degenerative disc (Fig. 1) in the cervical (neck) spine. The surgeon approaches the spine from the front, through the throat area. 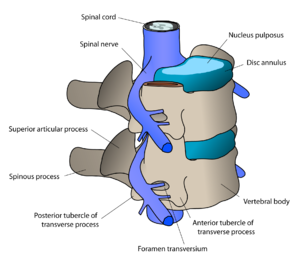 After the disc is removed, the vertebrae above and below the disc space are fused together. Your doctor may recommend a discectomy if physical therapy or medication fail to relieve your neck or arm pain caused by inflamed and compressed spinal nerves. Patients typically go home the same day; recovery time takes 4 to 6 weeks. Figure 1, top. (top view of vertebra) Degenerative disc disease causes the discs (purple) to dry out. Tears in the disc annulus can allow the gel-filled nucleus material to escape and compress the spinal cord causing numbness and weakness. Bone spurs may develop which can lead to a narrowing of the nerve root canal (foraminal stenosis). The pinched spinal nerve becomes swollen and painful. Discectomy literally means “cutting out the disc.” A discectomy can be performed anywhere along the spine from the neck (cervical) to the low back (lumbar). The surgeon reaches the damaged disc from the front (anterior) of the spine — through the throat area. 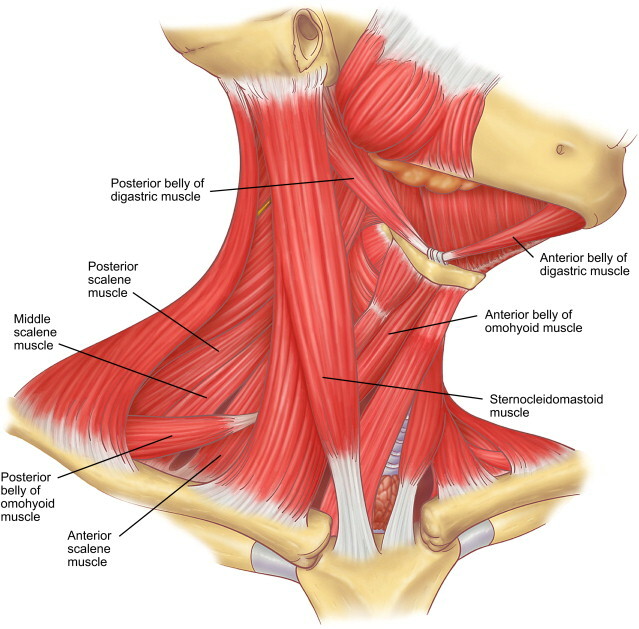 By moving aside the neck muscles, trachea, and esophagus, the disc and bony vertebrae are accessed. In the neck area of the spine, an anterior approach is more convenient than a posterior (back) because the disc can be reached without disturbing the spinal cord, spinal nerves, and the strong neck muscles of the back. Depending on your particular case, one disc (single-level) or more (multi-level) may be removed. After the disc is removed, the space between the bony vertebrae is empty. To prevent the vertebrae from collapsing and rubbing together, the surgeon fills the open disc space with a bone graft. The graft serves as a bridge between the two vertebrae to create a spinal fusion. The bone graft and vertebrae are often immobilized and held together with metal plates and screws. Following surgery the body begins its natural healing process and new bone cells are formed around the graft. After 3 to 6 months, the bone graft should join the vertebrae above and below to form one solid piece of bone. With instrumentation and fusion working together, the bone may actually grow around the plates and screws – similar to reinforced concrete. After fusion you may notice some range of motion loss, but this varies according to neck mobility before surgery and the number of levels fused. If only one level is fused, you may have similar or even better range of motion than before surgery. If more than two levels are fused, you may notice limits in turning your head and looking up and down. New motion-preserving artificial disc replacements have emerged as an alternative to fusion. Similar to knee replacement, the artificial disc is inserted into the damaged joint space and preserves motion, whereas fusion eliminates motion. Outcomes for artificial disc compared to ACDF (the gold standard) are similar, but long-term results of motion preservation and adjacent level disease are not yet proven. Talk with your surgeon about whether ACDF or artificial disc replacement is most appropriate for your specific case. Degenerative disc disease: As discs naturally wear out, bone spurs form and the facet joints inflame. The discs dry out and shrink, losing their flexibility and cushioning properties. The disc spaces get smaller. These changes lead to foraminal or central stenosis or disc herniation (Fig. 1). Your surgeon will also discuss the risks and benefits of different types of bone graft material. Autograft is the gold standard for rapid healing and fusion, but the graft harvest can be painful and at times lead to complications. Autograft is more commonly used these days as it has proven to be as effective for routine 1 and 2 level fusions in non-smokers. The most important thing you can do to ensure the success of your spinal surgery is quit smoking. This includes cigarettes, cigars, pipes, chewing tobacco, and smokeless tobacco (snuff, dip). Nicotine prevents bone growth and puts you at higher risk for a failed fusion. Patients who smoked had failed fusions in up to 40% of cases, compared to only 8% among non-smokers . Smoking also decreases your blood circulation, resulting in slower wound healing and an increased risk of infection. Talk with your doctor about ways to help you quit smoking: nicotine replacements, pills without nicotine (Wellbutrin, Chantix), and tobacco counseling programs. There are seven steps to the procedure. The operation generally takes 1 to 3 hours. 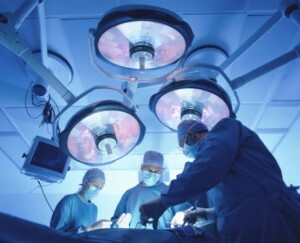 You will lie on your back on the operative table and be given anesthesia. Once asleep, your neck area is cleansed and prepped. If a fusion is planned and your own bone will be used, the hip area is also prepped to obtain a bone graft. If a donor bone will be used, the hip incision is unnecessary. A 2-inch skin incision is made on the right or left side of your neck (Fig. 2). The surgeon makes a tunnel to the spine by moving aside muscles in your neck and retracting the trachea, esophagus, and arteries. Finally, the muscles that support the front of the spine are lifted and held aside so the surgeon can clearly see the bony vertebrae and discs. Figure 2. A 2-inch skin incision is made on the side of your neck. With the aid of a fluoroscope (a special X-ray), the surgeon passes a thin needle into the disc to locate the affected vertebra and disc. To remove the damaged disc, the vertebrae above and below the disc must be held apart. Your surgeon first inserts a spreader into the body of each vertebra above and below the disc to be removed. Gentle tension is placed on the spreader to separate the two vertebrae. Figure 3. The muscles are retracted to expose the vertebra. The disc annulus is cut open and the disc material is removed with grasping tools. Figure 4. (top view) The disc annulus and nucleus are removed to decompress the spinal cord and nerve root. Bone spurs are removed and the spinal foramen is enlarged to free the nerve. Bone graft from your hip. A skin and muscle incision is made over the crest of your hipbone. Next, a chisel is used to cut through the hard outer layer (cortical bone) to the inner layer (cancellous bone). The inner layer contains the bone-growing cells and proteins. The bone graft is then shaped and placed into the “bed” between the vertebrae (Fig. 5). Bone bank or fusion cage. A cadaver bone graft or bioplastic cage is filled with the leftover bone shavings containing bone-growing cells and proteins. The graft is then tapped into the shelf space. Figure 5. (side view) A bone graft (blue) is shaped and inserted into the shelf space between the vertebrae. The surgeon may reinforce the bone graft with a metal plate screwed into the vertebrae to provide stability during fusion – and possibly a better fusion rate. An x-ray is taken to verify the position of the bone graft and the metal plate and screws (Fig. 6). New option: artificial disc replacement. Instead of a bone graft or fusion cage, an artificial disc device is inserted into the empty disc space. 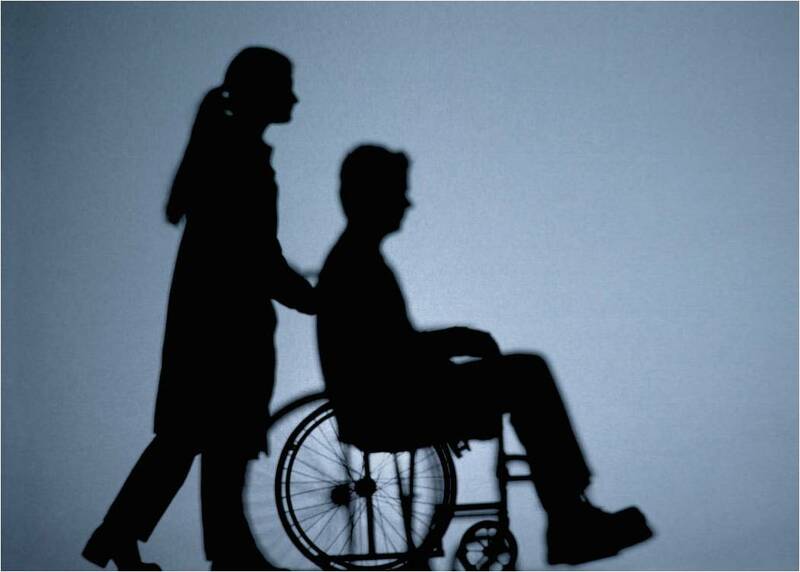 In select patients, it may be beneficial to preserve motion. Talk to your doctor – not all insurance companies will pay for this new technology and out-of-pocket expenses may be incurred. The spreader and retractors are removed. The muscle and skin incisions are sewn together with sutures. Steri-Strips or biologic glue is placed across the incision. You will awaken in the postoperative recovery area, called the PACU. Blood pressure, heart rate, and respiration will be monitored. Any pain will be addressed. Once awake, you will be moved to a regular room where you’ll increase your activity level (sitting in a chair, walking). Patients who have had bone graft taken from their hip may feel more discomfort in their hip than neck incision. Most patients having a 1 or 2 level ACDF are sent home the same day. However, if medical complications such as difficulty breathing or unstable blood pressure develop, you may need to stay overnight. You will be given written instructions to follow when you go home. After surgery, pain is managed with narcotic medication. Because narcotic pain pills are addictive, they are used for a limited period (2 to 4 weeks). As their regular use can cause constipation, drink lots of water and eat high fiber foods. Laxatives (e.g., Dulcolax, Senokot, Milk of Magnesia) can be bought without a prescription. Thereafter, pain is managed with acetaminophen (e.g., Tylenol). If you had a fusion, do not use non-steroidal anti-inflammatory drugs (NSAIDs) (e.g., aspirin; ibuprofen, Advil, Motrin, Nuprin; naproxen sodium, Aleve) for 6 months after surgery. NSAIDs may cause bleeding and interfere with bone healing. Do not smoke. Smoking delays healing by increasing the risk of complications (e.g., infection) and inhibits the bones’ ability to fuse. Avoid bending your head forward or backward. You may shower 1 to 4 days after surgery. Follow your surgeon’s specific instructions. No tub baths, hot tubs, or swimming pools until your health care provider says it’s safe to do so. If you have staples or stitches when you go home, they will need to be removed. Ask your surgeon or call the office to find out when. If your temperature exceeds 101° F, or if the incision begins to separate or show signs of infection, such as redness, swelling, pain, or drainage. If your swallowing problems interfere with your ability to breathe or drink water. Schedule a follow-up appointment with your surgeon for 2 weeks after surgery. Recovery time generally lasts 4 to 6 weeks. X-rays may be taken after several weeks to verify that fusion is occurring. The surgeon will decide when to release you back to work at your follow-up visit. A cervical collar or brace is sometimes worn during recovery to provide support and limit motion while your neck heals or fuses (see Braces & Orthotics). Your doctor may prescribe neck stretches and exercises or physical therapy once your neck has healed. If you had a bone graft taken from your hip, you may experience pain, soreness, and stiffness at the incision. Get up frequently (every 20 minutes) and move around or walk. Don’t sit or lie down for long periods of time. Anterior cervical discectomy is successful in relieving arm pain in 92 to 100% of patients . However, arm weakness and numbness may persist for weeks to months. Neck pain is relieved in 73 to 83% of patients . In general, people with arm pain benefit more from ACDF than those with neck pain. Aim to keep a positive attitude and diligently perform your physical therapy exercises. 67% of people who underwent ACD (no bone graft) achieved fusion naturally. However, ACD alone results in an abnormal forward curving of the spine (kyphosis) compared with the other techniques. 93% of people who underwent ACDF with bone graft placement achieved fusion. 100% of people who underwent ACDF with bone graft placement and plates and screws achieved fusion. Hoarseness and swallowing difficulties. In some cases, temporary hoarseness can occur. 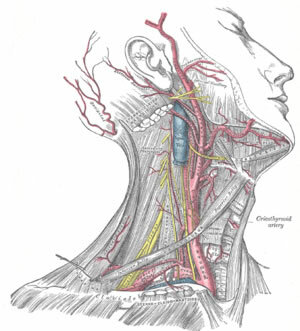 The recurrent laryngeal nerve, which innervates the vocal cords, is affected during surgery. It may take several months for this nerve to recover. In rare cases (less than 1/250) hoarseness and swallowing problems may persist and need further treatment with an ear, nose and throat specialist. Hardware fracture. Metal screws, rods, and plates used to stabilize the spine are called “hardware.” The hardware may move or break before your vertebrae are completely fused. If this occurs, a second surgery may be needed to fix or replace the hardware. Transitional syndrome (adjacent-segment disease). This syndrome occurs when the vertebrae above or below a fusion take on extra stress. The added stress can eventually degenerate the adjacent vertebrae and cause pain. Nerve damage or persistent pain. 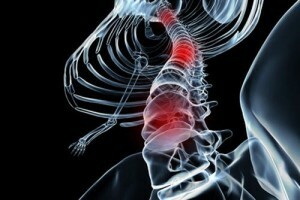 Any operation on the spine comes with the risk of damaging the nerves or spinal cord. Damage can cause numbness or even paralysis. However, the most common cause of persistent pain is nerve damage from the disc herniation itself. Some disc herniations may permanently damage a nerve making it unresponsive to decompressive surgery. In these cases, spinal cord stimulation or other treatments may provide relief. Be sure to go into surgery with realistic expectations about your pain. Discuss your expectations with your doctor. Bose B: Anterior cervical instrumentation enhances fusion rates in multilevel reconstruction in smokers. 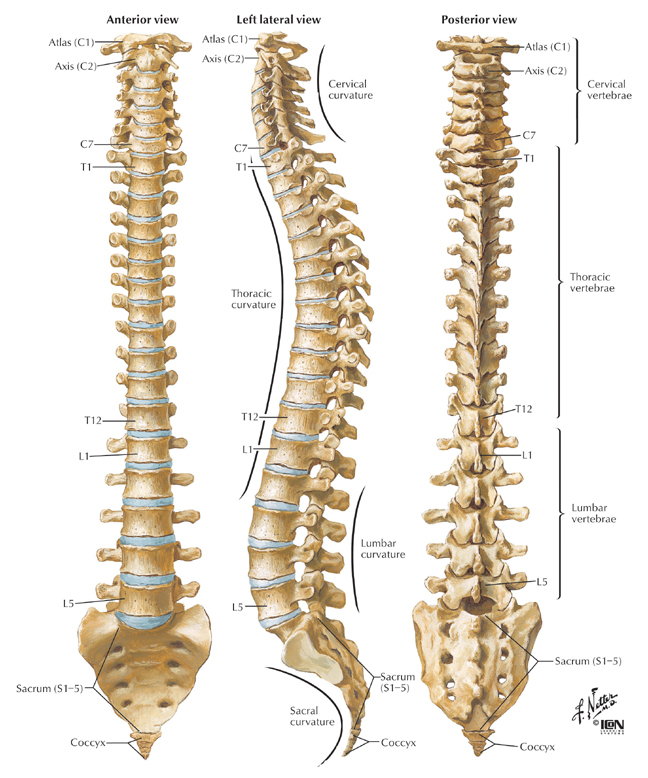 J Spinal Disord 14:3-9, 2001. Hilibrand AS, et al. : Impact of smoking on the outcome of anterior cervical arthrodesis with interbody or strut-grafting. J Bone Joint Surg Am 83-A:668-73, 2001. Xie JC, Hurlbert RJ. Discectomy versus discectomy with fusion versus discectomy with fusion and instrumentation: a prospective randomized study. Neurosurgery 61:107-16, 2007.
bone graft: bone harvested from ones self (autograft) or from another (allograft) for the purpose of fusing or repairing a defect. foraminotomy: surgical enlargement of the intervertebral foramen through which the spinal nerves pass from the spinal cord to the body. osteophytes: bony overgrowths that occur from stresses on bone, also called bone spurs.